Over 30 Mechanical Engineering seniors will be displaying their projects at the Summer mini-Expo on the 24th of July at the Love Building! The Capstone Design course is generously supported by numerous corporate partners and alumni. This article highlights one such select sponsor, their project and the student team working on the project. Capstone Design projects are sponsored by both large and small businesses alike. This week’s spotlight sponsor is first-time sponsor, Kambas Enterprises. Kambas Enterprises, a small business owned by Kim Kambas, is sponsoring a Summer 2018 ME Capstone Design project to improve the design for an outdoor textile heater. Problem: Last year, Kambas was looking for a towel warmer to keep next to her hot tub. After searching for an outdoor towel heater, she discovered that there are no towel heaters on the market that will safely heat towels next to an outdoor hot tub. After sitting in a hot tub, a person’s body temperature increases. Once they leave the heated environment, the loss of heat through their skin results in feeling cold. A towel heater would mitigate the loss of body heat when someone leaves a hot tub. Kambas’ main concern is having an outdoor-safe method to heat towels to a higher temperature than her original prototype. Projected Impact: Pool and Spa Marketing estimated that 7.3 million hot tubs were used in the United States. Mr. Steam, a major towel heater producer, cautions that incorrect use or installation of towel warmers can end in serious injury or death. With the lack of safe, outdoor towel heating options on the market, Kambas Enterprises wants the new textile warmer to improve the safety of heating towels for hot tub users. This project has already made a large impact for Kambas Enterprises by providing skills needed to improve the original textile warmer prototype. The team’s improvements to the original prototype will make the towel warmer easy to manufacture. Kambas will use the towel warmer as the first product in her business, but plans to include more products in the future. Proposed Solution: Team “Towel Heater” created three different prototypes to determine the most effective heating solution. The sponsor’s old prototype used conduction to transfer heat directly from the heating mechanism to the towels. During testing, the team discovered that their convection chamber design heated the towels to a higher temperature and at a faster rate than the other two methods. The final temperature of the towels at 400 seconds utilizing a convection chamber was approximately 42% higher than using conduction. The new design uses a sun deck storage box with a rack inside to hang towels on. 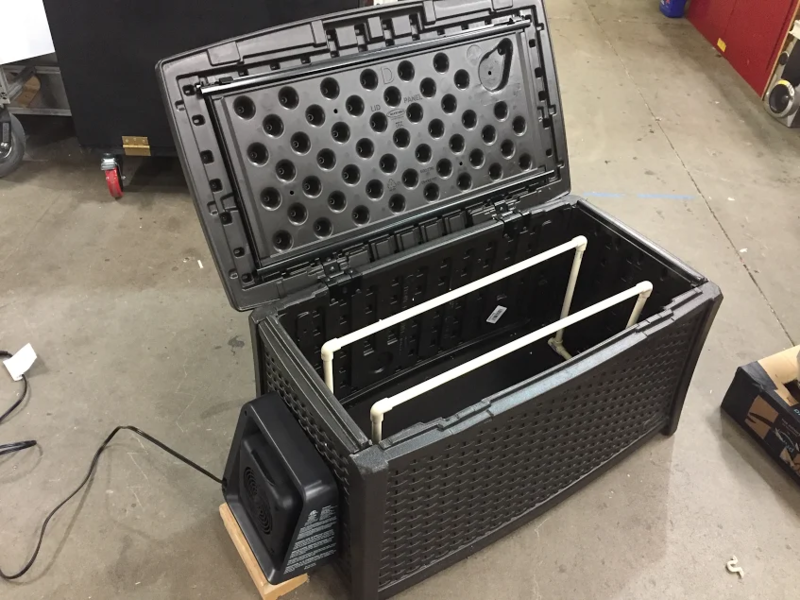 A space heater is used to heat the air inside of the storage box to create a convection chamber. Kim Kambas was encouraged to utilize Georgia Tech students as a resource for starting her business by the Small Business Administration. She has enjoyed working with the team and has been impressed with their skill sets. Kambas encourages other beginning entrepreneurs to sponsor Capstone Design projects as a means to increase their odds of being successful in their businesses.